Challenger's Soccer Camps & Programs will be coming to your community this summer! See your camp details below and register today. If your child enjoyed our British or TetraBrazil camps, they will love our new International Camp! We have taken our most popular elements from our previous camp programs and have woven them into a new curriculum which will now include some of the most effective practices from around the world: USA's small-sided, France's possession, Brazil's creativity, Britain's speed/power/fitness, and Spain's passing & moving. The Challenger International Soccer Camp will offer programs for each age/ability level. are also available at selected locations. If your child is looking to seriously improve their game and needs something more challenging than a regular soccer camp, then Challenger Next Level Training is for them! The Next Level method of training has been developed for competitive players who require a more demanding camp program that will allow them to work intensively on their skills and that will help them grow technically, tactically, physically, and psychologically. The Next Level summer program maximizes training time by rotating players between specialized training stations that focus on key areas of individual performance including, speed of play, fast foot skills, first touch, advanced techniques, freestyle, strength, agility & quickness, attacking moves, finishing, and small-sided games. The Next Level program will also include Challenger’s iChallenge training app which will help players develop skills and creativity both pre and post the program. GK Icon is the leading provider of professional goalkeeper training globally and prides itself on maximizing the potential of all young and developing goalkeepers. Instructed by qualified, experienced and personally selected coaches, GK Icon camps train players in shot stopping, handling, footwork, diving technique, crossing, distribution, 1v1's, decision making, and much more. If your child is seeking professional goalkeeper development and advanced training techniques, this is the camp for them. Challenger International Camp Gifts Include: Free Camp T-shirt, Soccer Ball, Action Poster with Camp Report, 12-month Subscription to Online Coaching Resource and the Challenge Personal Coach App. To receive your Free Jersey, sign up 30 days prior to your camp's start date at challengersports.com. Only available while stock lasts! S&H fees apply. 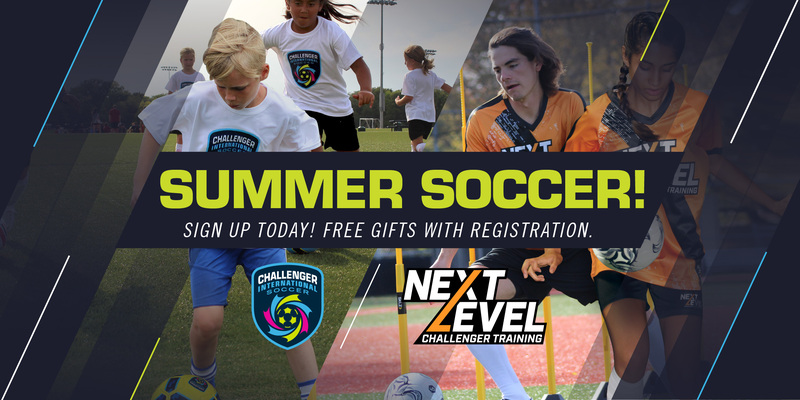 Next Level Program Gifts Include: Free Next Level Jersey, Short & Socks, Challenger T-Shirt, Challenger Soccer Ball, Personal Evaluation, 12-month Subscription to Online Coaching Resource and the iChallenge Personal Coach App. GKI Icon Camp Gifts Include: Free GK Icon Jersey, Challenger T-shirt, Challenger Soccer Ball, Personal Evaluation, iChallenge Personal Coach App & Access to high-quality GK products. Players can now practice skills and freestyle activities at home by participating in video challenges and contests with other soccer kids around the world. iChallenge motivates and inspires players to reach new levels of skill and creativity throughout the year with virtual access to professional coach training. Download the app, get access to 20 free skill videos, watch, practice, master the skills, and get professional evaluations on your performance! Spring Soccer registration is OPEN!! PreK-U8 seasons run from April 27 through June 16. Our 9U and older squads will start practices when the weather permits. Please write SiobhanDeGray@hotmail.com with any questions.